The Samsung 4G LTE Mobile Hotspot LC11 is the latest mifi device for portable internet for wifi enabled devices. By connecting via wifi to the device, a laptop, iPhone, iPod touch, Android device or any other device that can connect to it, a user is able to connect to the internet using the cellular data signal received by the mobile hotspot. The difference between this mobile hotspot and the previous models is the introduction of 4G, a higher speed data transfer signal than the previous 3G models. I’ve been using the Samsung Mobile Hotspot for a couple weeks now and can honestly say I love using the mobile hotspot. The speeds are blazing fast compared to previous mobile devices I have used before. It’s great for streaming music, watching Netflix and surfing the web. When the 4G network is not available, it defaults to the 3G network, which is not as robust as the 4G network, but passable for most uses. I had two minor issues when using the mobile hotspot. The first was when taking a train while watching Netflix. The movie tended to freeze when switching from the 4G to 3G network while traveling to areas that did not have 4G implemented yet. Of course, the movie streamed much better under 4G and didn’t artifact too badly under 4G. The other issue I had was creating an ssh session to edit files on a server. The connection tended to time out when I would switch to other windows, but an ssh connection tends to disconnect itself when it idles in conditions like these. 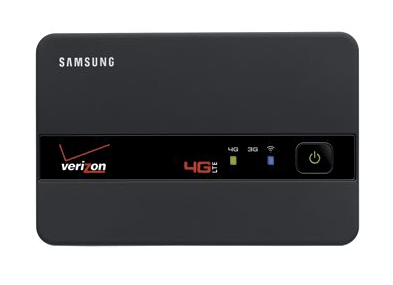 I have found the Samsung 4G LTE Mobile Hotspot LC11 to be a great new tool in my digital arsenal. Its speeds are amazing for a mobile device and can supply connectivity to up to 5 devices at one time at a speed that is about a fifth of my home Fios connection. I now carry it almost everywhere with me so I no longer have to rely on Starbucks internet when moving around the city.